Spotted today, springfully apropos! Brought in some soil – oh how I loathe purchasing dirt but what’s a gardener to do before the first turning of all that’s in the compost bin. 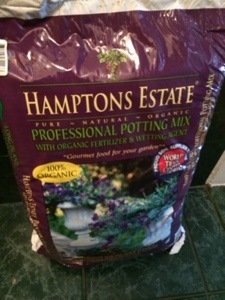 Any suggestions for an alternative to buying soil and/or recommendations for your faves (going generally for organic here – though I’m open – and preferably w/out artificial stimulants and other such mishigas). Go ahead … Gimme the dirt! It’s alive! Not sure but I think that’s from a scifi movie. There were some stirrings in the yard last I checked, but most of the ground is covered with leaves from last year. 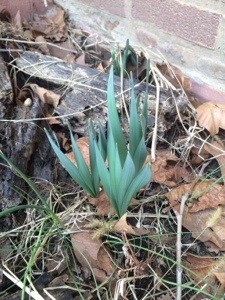 Pretty soon some of the heartier plants are going to start seeing the outdoors again. Yesterday I went looking for garden related apps for my tablet. Excluding plant vs zombie games there seemed to be some interesting choices. I started installing a medicinal plant ID app until I checked the permissions. Why would an app like that want to monitor what I purchase on my credit card and who is in my contact lists? I can take a few guesses and I don’t like any of them. I have no doubt I will find some good apps and will post them as I try them. I saw apps that help you plan a garden, tell you when to plant, and a variety of other good information. I should have mentioned sooner that the apps were on the Google Playstore for Android- which means they will work on many phones and tablets… nice! Nice indeed! 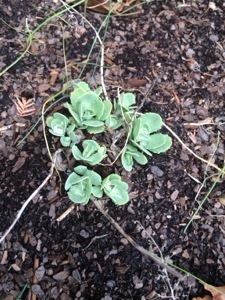 Keep us posted on any good gardening apps you find, and I’ll keep an eye out as well. Well, after trying out a vegetable gardening app I removed it from my tablet. Long story short, the app would not end in a normal manner, and when I did stop it I found it left a process running. The first time I started it the first ad that came up was for Roundup! I ignored that, decided that because I could kill the process it left behind I would check out the app anyway. Then I found out it would not run without an internet connect- strike 3, it’s out! In all fairness I must say that if any app wants to check out my phone activity, contact list, accounts, &c I won’t use it. If anyone doesn’t care about that there are lots of apps for gardening I will never try. I have installed a couple apps. So far I checked out one called Garden Design Ideas. Basically it’s over 100 pictures of gardens. They range from fairly simple to elaborate. For just a quick look I saw a few good ideas. I think it’s worth checking out. Today it’s not too cold out and steadily raining. I put my larger potted plants outside for about 2 hours to get some rain on them. Being inside through the winter in very low humidity I think they appreciated getting dripping wet. Also, it’s the first step for getting them hardened for being out full time. I also have to buy some soil. I have about half a bag outside from last year. My as of yet unidentified succulent grows and multiplies fairly fast. A couple have outgrown their pots and need to be split and/ or transplanted. I will probably give a few away for space reasons. They’ve grown and multiplied at work under only fluorescent lighting never seeing full darkness and not getting much if any over 70 degrees. The larger part of it I split off and kept home on the window sill started turning an odd color. Eventually I realized it wasn’t used to the sun. I moved it off the window and am gradually exposing it to the sun again. I’ll see how that works out in the next couple weeks. It was a good reminder to do the same with other plants when the weather warms up some.